Go to Kickstarter for further information and get your own Yomee! Yogurt is good—a healthy, delicious, and convenient food that we all love. And studies are continuing to discover yogurt’s infinite health benefits: boosting our immune system, maximizing our heart health, and strengthening our bones. When it comes to yogurt, we just can’t get enough.. But not all yogurt is created equal. Many mass-produced brands fill their products with preservatives, artificial flavors, and added sugars—cancelling out most of yogurt’s amazing natural benefits. The solution is obvious: homemade yogurt. Only then can you control ingredients and guarantee freshness, every time. But making your own yogurt is difficult, right? Introducing Yomee, the world’s first automatic yogurt maker—giving you fresh, craft-quality yogurt at a third of the cost of store-bought brands. We began with a simple but powerful question: How can we enable people to make perfect yogurt at home? Yomee is our answer. 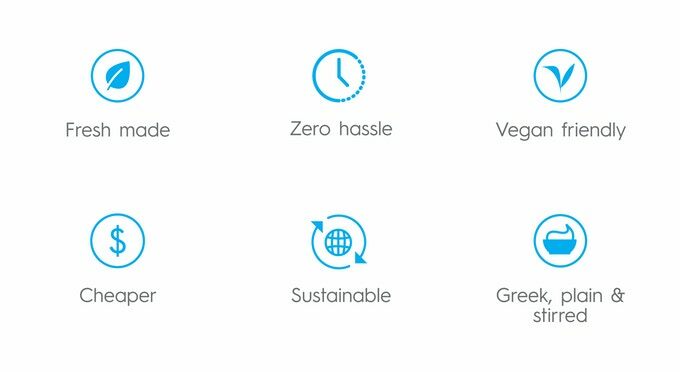 A smart yogurt maker that automates and simplifies the yogurt-creation process—letting you decide exactly what goes inside, and lowering costs by a whopping 70%. With Yomee, creating perfect yogurt every time from the comfort of your home is effortless and foolproof. 1. Pour in your favorite milk. 2. Drop in a Yomee pod. 3. Select your yogurt type (using the Yomee app)—and relax, fresh yogurt is on the way! A short 6 hours later, enjoy perfect yogurt: fresh, chilled, and ready to eat (now or later)! And since each pod makes 2 servings, share your yogurt or enjoy it throughout the day. Yogurt is limitless—having as many health benefits as it has preparation styles. Eat it raw, drink it in smoothies, use it to make açaí bowls... Our team has already created hundreds of recipes for the Yomee app, so that you'll never run out of creative food ideas. Our free Yomee app will be iOS and Android compatible. Besides offering countless yogurt-based recipes, the app lets you select what yogurt style you want your Yomee to make: a thick Greek-style yogurt, a traditional plain yogurt, or a smoothie-style stirred yogurt. Plus, our app keeps you well informed about every stage of the yogurt-making process, alerting you when the yogurt is heating, cooling, incubating, and ready to eat!